I have a '84 Trek 520 that I just got and low and behold the seatpost is stuck. I got the bike for a pretty good price and as it happens it's my size. I've been squirting PB Blaster down the flutes and all around the seatpost but it isn't moving. I've contemplated more drastic measures like cutting/stronger oils/acids/bases to get it to release, but the seat is stuck at what I feel is pretty much the right height for me (test fitting without riding). So before I break out the sawzall/hacksaw or the hazardous chemicals, is there any reason to go further if it is set at the right height? I was hoping to apply framesaver, but without the seatpost coming out I would be missing a good bit of the frame. My thoughts are that before I get extreme I should wait and see if it fits me as is (waiting on wheels/tires and other ancillary parts). 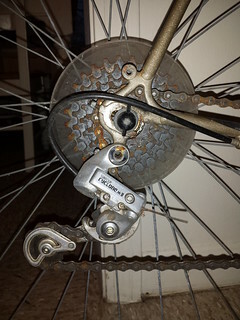 If it needs adjusting then I'd have to re-disassemble the bike, which I'm perfectly capable of doing, and then getting crazy on the stupid seized chunk of alloy, at the same time I'd apply framesaver. 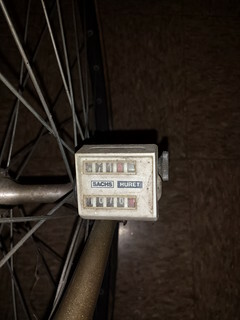 The bike was neglected, not abused, as far as I can tell it has around 1676 miles, at least that's what the Sachs Huret cyclo(non)computer says. I bought it from a gentleman that was cleaning out his late grandfather's basement who said it was there for probably at least the last 15-20 years. I also know that BF members don't reply to a thread about a bike unless it has pictures so here are some before pictures. That is a Big frame. I would locate some Kroil in a can, not the spray version. 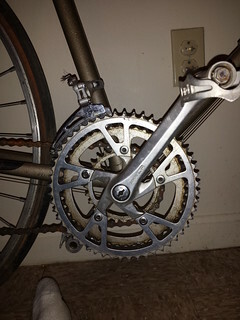 Take out the bottom bracket and pour 8 oz or so into the frame inverted, set it in a pan to catch the penetrating oil when it does creep through, and then attempt removal. Maybe some dry ice held against the seat post too after a week. The aluminum will shrink faster than the steel, that will help too. Looks like a nice rider with a few tweeks. 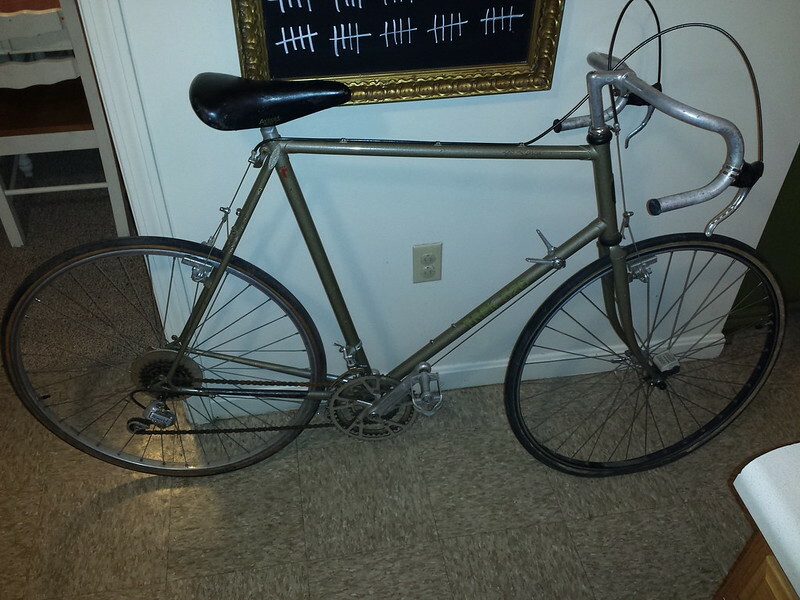 IMO, looks like it sat out in the rain sometime during its life or in a very humid basement based on the chain, freewheel and seat post binder bolt rust. 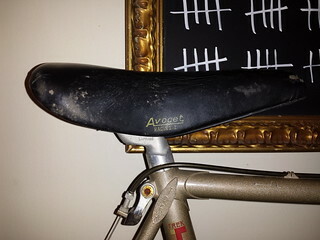 Also, the fluted seat post is currently inserted to a level where water can use the fluted sections of the seat post to continue entering the seat tube, i.e., the bike was probably used by a rider that was a bit short for this size of frame? Generally a bit more seat post would be exposed for an optimum rider fitting of a road bike. Be sure to give the HB stem a try as well. Sometimes the two go together in misery. Certainly, if the post is at the right height already, there's no reason for serious effort to remove it. BUT, something to think about is that if that saddle is the right height, the frame is 2-4" too tall for you. Also, take a moment to remove and check the stem height, because it appears not to be inserted deep enough. I've had luck removing stuck LaPrade seat posts by putting the head of the post in my bench vise (after generous application of lubricant), and then moving the frame itself around the post. Yes I know the frame is on the big size(even for me), and to be honest I think the seat would be perfect just a bit higher than it is, but with the Brooks saddle I think it'll be ok. Again, I haven't been able to ride it yet so this is all speculation. I like a more upright position and have decently long legs so I've been wanting to try a larger frame than what I already have (23.5"). I don't care much for seat-handlebar drop so I wanted to try a larger frame with a more relaxed geometry. This is the first time I disagree with FB. You need to remove stuck parts on a bike IMHO. First, it is only going to get MORE stuck and harder to remove. Secondly, what if you ever want to sell the bike? Stuck parts drop an atom bomb on the price. Third, as you have already found out, stuck parts prevent maintenance. In the case of a stuck stem, its even worse. You cannot adequately maintain a HS with a stuck stem, nor can you replace the HS (they do wear out). Fourth, does it really "fit"? Its a pretty strange set up right now with stem at max height and seat post slammed. There is an endless amount of information out there on freeing up stuck post and stem. Yes, it is a major PITA, but you are talking a one hour job at most (cutting it out). If a simpler method works, great! As far as what works to remove stuck parts, everything works SOMETIMES. Do enough of them, say 30 to 40, and you will find that your special method does not always work, unless it involves cutting it out. Most that report 100% success without cutting, have only done a handful of stems. Heck, I was 12 for 12 at one point with my "secret" method. Then I was 12 for 13, then 12 for 14, then 12 for 15. Turned out, it wasn't 100% after all. I had a similar 520, same year. It was a garage sale find, and sure enough, stem and seat post were both stuck. I'll buy bikes with stuck parts but the price has to be cheap. To those that say: "I am not a flipper, I am not going to sell this bike", great. But a steel frame Trek could last another 60 years. Nothing is forever. And maybe someday you want to give it to a son, nephew,, friend, or whatever. Do you want to give them a damaged bike, or do you want to give them something in good working order? Again, it is only going to get MORE stuck. Removal now may actually be relatively easy (Kroil, bench vise, etc). And the sale of a bike that is too big can fund buying a bike that is the right size. Last edited by wrk101; 03-29-15 at 06:42 AM. That is kind of the mindset I am in wrk101, that it's stuck and it should not be. I have the bike torn down in the stand right now but haven't messed with the stem yet. That is on the list next to see if it is stuck, and since it was in a nice humid basement for 15+ years I assume it will be. The grease in the BB was in surprisingly good condition, in fact it was what I would still consider to be usable, but as I do for any bike I may keep as a rider, I completely disassembled it to re-grease the bearings. I too admit the seat height to stem height doesn't seem conventional, and I think that was probably to help a man in his 70s-80s to ride a bit more upright. I think I may try Kroil if I can find any and then I may have to resort to cutting, which admittedly scares me a bit. I'm moving soon and wanted to get this bike right before the movers come to pack everything up but I may not be able to. I hate to throw things in a box mid-project to wait a few months until I can finish it up. Might just get it ridable for now and worry about the seatpost when we get to our new house this summer. 1. The stuff that works best on dissolving the corrosion between alloy stem/post and steel tubes is usually ammonia. It takes some time, needs to soak in there. 2. I've personally had good luck with ammonia soak, followed by Freeze Off (auto supply places). 3. As stated earlier by nlerner, a large, well mounted vise is far and away the most effective tool I've used for this operation. 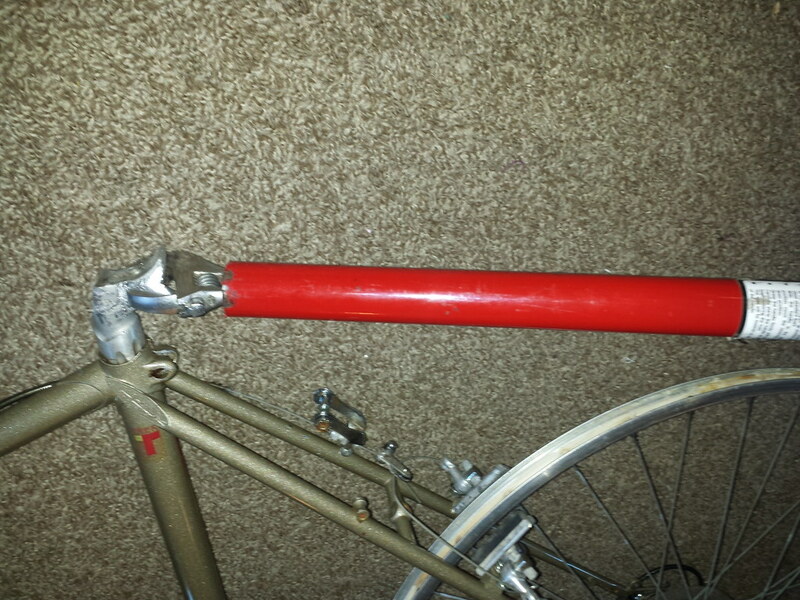 It also works for stems, if you either make yourself a fork holder thingy from a chunk of 2x4 and a front fork mount from a rack or one of the ones they sell to bolt to the bed of a pickup truck. Or you can clamp a sacrificial hub in the fork, and grab that in the vise. But the fork is more fragile than the frame when doing this twisting. 4. With the bb removed, you ought to have access to everything for your frame saver treatment, except for the steerer tube and head tube. Little update, just ran out to check the stem and it's as free as it could be, not to mention that it's got about another 1/2" until it is at the minimum insertion line. Wasn't stuck at all, as soon as I loosened it, the fork turned just from the tilt of the work stand. How would one access the top tube with the fork installed and the seatpost? I'm not sure about how much corrosion could happen in the top tube but I don't see how to access it with frame saver without either end being open. I have been thinking about the ammonia treatment too. Is the seatpost usable afterwards(not that I care too much)? Also, I should add that the PB Blaster that I sprayed into the seatpost clamp area/flutes does come out the bottom into the bottom bracket but I don't think it does anything to eat away alloy/steel corrosion. Last edited by hillikus; 03-29-15 at 08:32 AM. ...yes, sorry. I was assuming something I should not. ... the dilute household ammonia available to most of us works pretty slowly on aluminum corrosion, so usually (if the post is not otherwise damaged in the vise or with a pipe wrench) it turns out to be quite usable. But yeah, mostly you just want it out of there. New ones are cheap and readily available. I don't have anything to contribute but I am curious about what you're counting on the picture behind the bike. N + 1 perhaps? Good luck with the post. Attempting to twist the frame around the seatpost is a recipe for disaster- one result could be a broken stay braze. + 1 to the suggestions above, particularly the bench vise. Give me a lever and I'll move the world, or get out a horrendous stuck seatpost, as the fellow said. ...oh please. If you clamp an old hub in the drops or use and old axle double nutted on there, the risk is quite minimal. Sure, bad stuff can happen. I've helped people do this countless times. the one disaster was when the frame tubing ripped right at the seat clamp collar. The frame was a loss anyway if we did nothing. Last time I tried ammonia and freeze off, it was a total, complete fail. Nothing works all of the time. 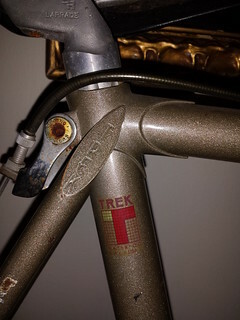 I welcome anyone with a sure fire 100% solution short of cutting it off to my workshop, as I have a nice Trek 510 waiting for post removal. As far as the twisting, I have bent a frame that way. You can put tremendous strain on a frame with the twisting motion, and frames are not designed for it. I still occasionally use the twist method, encouraged with Kroil, as it works about 90% of the time. I am just more careful with my twist effort. I've tried industrial ammonia, kroil, pb blaster, heat, cold, Freeze Off, but most are no go. You might loosen the seat pinch bolt, keep adding the penetrant of choice and ride it for a season. It may loosen up over time with ride vibration. Since it can only sink an inch from it's current position, you won't be traumatized when and if it moves. If nothing happens, then corrective surgery with a sawzall and a wide tooth blade. You might loosen the seat pinch bolt, keep adding the penetrant of choice and ride it for a season. It may loosen up over time with ride vibration. Since it can only sink an inch from it's current position, you won't be traumatized when and if it moves. This is how I get out stuck cotters on old cranks; loosen the nuts, squirt everything with PB, and go for a ride. If the seatpost really is at the right height for you, no reason not to give this a try. And try as long as you care to. Last edited by Lascauxcaveman; 03-29-15 at 12:07 PM. Partial VICTORY! I used a large crescent wrench on the squared off seat clamp area(didn't have monkey wrench) with a 4 foot cheater bar and got it to spin. It's a beast to spin, but it's spinning so now it's only a matter of time. I used PB Blaster for a number of days, and the last day or two I used Marvel Mystery Oil since that works to wipe off aluminum oxide I figured it may help with the seat post. Don't know if that did it or the PB blaster or the 4 foot hernia bar, but either way it's loose now. Now I have to figure out how to pull while twisting....might be a two person operation. Easiest way is a vise. Hold the post, pull the frame while working side to side. Second easiest way, step into the V where the down and seat tubes meet, with yiur hip stabilizing the frame from twisting. Use one tool to turn the post, and the other hand to grip and pull on the post as you turn. This method works twist in one direction continuously. Either way usually causes some heat so keep the post well oiled with penetrant, and rest it to cool as needed. My 99% sure fire process is a 1/2in threaded cro-mo rod down the center of the cut of seat post, with nuts and washers threaded on to the rod thru the BB opening, then a short section of gas pipe with an ID fractionally larger than the OD of the seat post, and another gas pipe converter section threaded on, that has an ID slightly larger than the threaded rod, more washers, nuts (note all the nuts should be Grade 8 or better), LOTS of lubricant. The hardware gets SIZZLING hot. Pull up until touching the inside of the gas pipe converter, disassemble, cut off, repeat until removed. This set up is quite cable of exerting over 10000 lbs of force. There may be some cosmetic damage around the top of the seat tube. What we are fighting here is aluminum corrosion growing into the surface roughness of the inside of the steel seat post. This cannot happen with a black anodized seat post - the outer layer is already corroded (anodized) and sealed. It is also less likely to happen if the inside of your seat tube is polished. Cheapest thing is to properly grease your seat post.